These Integral Flange Connectors are receptacles with integral cable clamp having a flange mounting arrangement. These Integral Flange Connectors are receptacles with integral cable clamp used at the end of the cable and have no mounting arrangement. These are intended for interconnecting two cables. Being the most reckoned names in the industry, we offer technically advanced array of Steel Forged Connector that are valued for high quality and excellent performance. Our entire product range is dimensionally accurate in nature. Size: 1/2" to 4" or any other customized size. We are the best supplier of Flange Type Connector. Aashu Telecom Pvt Ltd deals in all type of Connector. We are the importer and stockist of all type of connector. From our wide consignment, we are offering to our patrons an optimum class variety of Flange Connections. 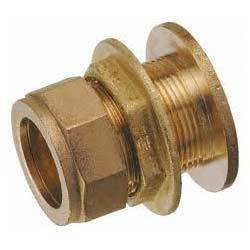 We provide the highly efficient Flange Connector to clients in a wide range of specifications at budget friendly prices. Owing to the rich industrial experience and expertise in this business, we are involved in providing Flange Connector (Sterile Flange Connector). To meet the precise requirements of our customers, we are engaged in offering Flange Connector.